It's not the heat. I can’t stand warm weather so I try to have air conditioning installed wherever I lay my hat. It’s not the green stuff, truly beautiful but my allergy requires constant medication and I keep sneezing from March to June. It’s not the birds - a busy woodpecker keeps waking me up by hammering my cottage. What is it, then? It’s the light, the Nordic light. The slow evenings, just a couple of dusky hours and on comes the light again. With the birds, the green stuff and the heat. Well, you can’t win’em all! So I turn up my AC, I blow my nose and take some more Loratadin, I forgive the woodpecker and wish I could save some of this light for a darker, gloomier day. And I remember Midsummer last year at Storulvån in Jämtland. Beautiful surroundings, friendly people, superb dining. Wish I could be with you again this year. 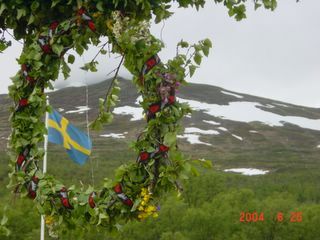 Happy Midsummer, in Storulvån and everywhere!